Design Nutrition’s Magnesium and EJC-6000 – I can’t say enough good about them. They are miracle workers. 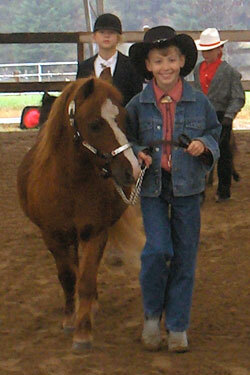 It was concluded in May 2007 that my 20 year Tennessee Walk, gelding (Duke) was EMS (Equine Metabolic Syndrome). 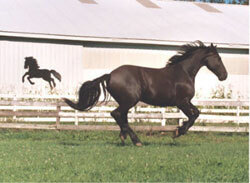 From all my research, it appears EMS will explode arthritis if a horse already has it. That’s what happened with Duke. The arthritis exploded in his hocks and left shoulder; the pain coming on seemingly overnight. 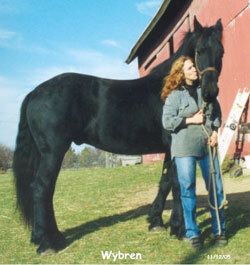 Someone on an equine message board gave my the link for Design Nutrition and only said, “talk to this lady”. So, I sent off an email with a myriad of questions. I was going to have to trust someone with Duke’s well-being. After reading and re-reading Sarah Davison’s immediate and in-depth response, I decided to put my trust in her Design Nutrition products. I feel like Sarah Davison has not only saved Duke’s life with her excellent products, but she has given “the old Duke” back to me. He is back to bucking and playing and being his annoying alpha self in my herd of four. His high level of energy is back, his pain is gone. For the first time since last Spring, Duke was able to stand for the farrier without quivering in pain — all thanks to the EJC-6— that he has been on since early summer. I can’t give Bute to Duke, but in hind-site that was the right thing because I saw the proof of just how good the EJC-6000 is. Then there’s the magnesium for his EMS. In less than 10 days of being on the magnesium, the cresty neck was greatly reduced and his mane started to grow back. All I did was brush him for the picture taken on 10-14-07 in the halter. His coat has a healthy shine now that he is back on track, so-to-speak. I feel it is important to note that his true liver chestnut coat came in this year for the first time in a few years. The color change in his coat was a very subtle warning that I overlooked. It took him losing nearly 100 pounds in about 6 weeks last Spring that I knew something was wrong. Thankfully Duke has never foundered. I am confident I can maintain Duke’s present level of health for many years to come with the excellent products from Design Nutrition and the specialized diet that was created for him. 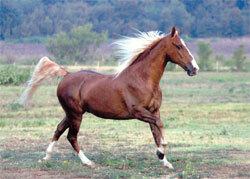 I own a registered Arabian, who developed bone spavin when he was about 10 years old. 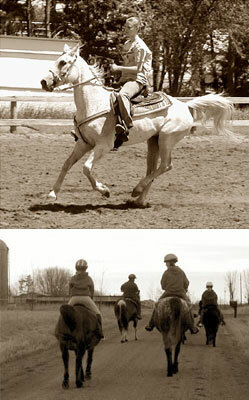 I started training him for dressage as a four-year-old, and he did very well. By ten, he was starting to have pain in his hocks and I had him x-rayed by my vet who put him on Cosequin for hock arthritis. 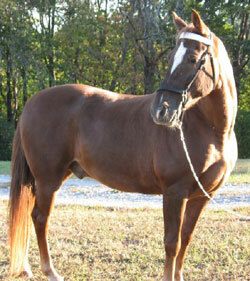 I have kept him on many joint products and he has had hock injections and was given Legend. He never was real comfortable. 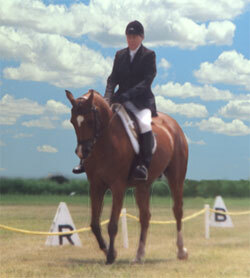 By 18 years I stopped doing dressage as he was too sore. 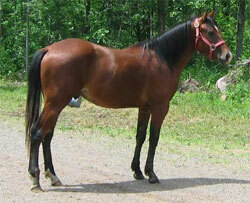 We got Snickers as a gangly range-bred and raised colt at 16 months old. The photo of him older was taken on his 2nd birthday June 4, 2006. I wanted to write to you and let you know how wonderfully effective your product EJC6000 is. We are so lucky to have found this product. I have tried many of the “tried and true” brands, and they were not even close in effectiveness. We have a rescue operation here called Miracles of Motion, and deal with many throw-away horses, most of them have moderate to severe joint problems. Because of the use of your product on these poor old guys, they are now back to themselves, on trail rides and in competition even! I have sent some pictures of these guys, that we have rescued, Please know that your product is instrumental in the rescue and rehabilitation of these horses, to the happy, healthy state they are in. P.S. With winter approaching, and living here in Minnesota, we really need you! EJC6000 prevents a lot of pain for these guys, and even the babies, to ready their joints for the years of MN living to come. I have been feeding my 17-year-old Tennessee Walking Horse gelding Merlin the ECJ6000 Joint supplement for almost a year now. I feed one scoop with his morning feed and one scoop with his evening feed. Before I started using ECJ6000 I had tried other joint supplements and I just was not seeing the results I wanted to. I wanted to keep Merlin on a joint supplement that WORKED because he would be stiff and stocked up in the mornings when I would take him out of his stall. Also, on rides, I would hear what sounded like his shoulder “clicking” every 10th step or so, and I was a little worried about that. I must say that ECJ6000 is a wonderful supplement and after sticking with it for this long the results speak for themselves. Merlin is not as stocked up in the mornings, when I lead him out of his stall in the mornings he is not so stiff anymore, and the clicking in his shoulder has gone away. Merlin moves and acts like a 5-year-old! I am so happy with this product I will never go back to anything else. This combination of ingredients really works well for my horse, and I have found that the price is extraordinarily reasonable. has a lot of heart and flash and loves to show off. Your EJC6000 makes it easier for him to move. I have found that your product is the best value on the market and the easiest product to dose. The scoop is so small and the canisters are such a good deal. It’s not very often that you can spend $50 for a product that will actually last 2 months. It is more common to spend $50 for a month.